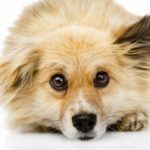 Separation anxiety in dogs is a common and serious issue. It can cause nervous behaviors like chewing, destruction and pacing, along with urinating and defecating. If you work in a shelter with anxious dogs or have one at home that howls every time you leave him alone, there are simple ways to help calm and soothe nerves without medication. Simply changing his mood with the right music can relax him enough to rest and fall asleep without destroying your home in the process. Many people leave the radio or favorite iTunes stream on all day in hopes it will keep their pets entertained and battle their loneliness. But dogs understand music differently than we do, so it’s wise not to assume they will like the same rock, hip-hop, blues and country that you tap your foot to. Dogs hear at a higher frequency than people do and process audio differently. Animals may hear your music as grating and need their own music designed with the right pitches and tones. 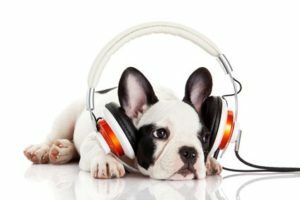 Mix up your music library and try tunes specifically designed for dogs, like a CD from Canine Lullabies. Dogs need peaceful music and are known to relax while listening to simple melodies and fewer instruments in a score. 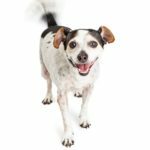 Canine-designed music typically promises to soothe dog separation anxiety by stopping unwanted barking, reducing hyperactivity and calming your dog. Choose a quality speaker that isn’t too loud for your dog, doesn’t pop with static or have loose cords that he could chew on. Use pet-friendly speakers or be sure to place it high enough to keep out of curious paws’ way. You may not need anything special to calm your dog other than what’s already in your sophisticated music collection. 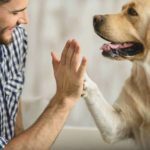 The Journal of Veterinary Behavior shows that classical music can actually reduce dog separation anxiety and comfort them. This can be especially helpful for dogs living in shelters and suffering from social isolation. Dogs listening to classical music are shown to spend more time in a resting state and bark less than other dogs. I’m sure you can guess that if dogs like classical and soothing tunes, that heavy metal proves an agitation. 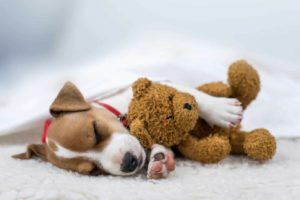 Anxious dogs that have difficulty resting or sleeping could benefit from canine-designed music like Through a Dog’s Ear. The company builds on Dr. Alfred Tomatis’ psycho-acoustic research. He realized sound could work as a nutrient for the nervous system and studied how it affected the human nervous system. Through a Dog’s Ear builds on that foundation of research and expands it toward dogs. They studied how canines process auditory information and music and created audio that naturally triggers relaxation responses. 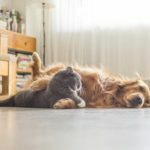 This type of response is ideal for noisy, crowded dog shelters, but can also benefit dogs in your home that are hyperactive and show difficulty winding down and sleeping. In 1980, Carnegie Hall hosted an orchestral debut, Howl, featuring the musical work of 20 human voices and three dogs. Were they really singing? Research shows canines have a sense of pitch and can be encouraged to howl when the long note on a violin is playing. Some people like to think howling is a form of singing. Others think the dogs are having a good time. Regardless of why your dog is howling at the music, if he seems to enjoy it, let him serenade you. Just maybe not at bedtime.